I’ve been under the weather and craving the foods I like when I’m sick: fruit, yogurt and biscotti. The fruit and yogurt are easy to come by, but the biscotti has to be baked. And I don’t know about you, but baking biscotti is not the first thing I think of doing when I have a fever. Or is it? I really wanted some biscotti yesterday, so I took an Advil and made a batch of this using some stuff I had in the pantry — white whole wheat flour, butterscotch chips and walnuts. These biscotti (technically, cantuccini) were so good that I found myself wondering why I even bother with other recipes. This recipe is just so easy and you can vary the flavors as you wish by changing out the nuts, chips, type of flour and extract. The dough slices very neatly and the biscotti bake up crunchy, but not tooth-breakingly hard. I think the only problem with this recipe is I could eat the whole batch in one sitting. Preheat the oven to 375 degrees F (190 degrees C). Line a cookie sheet with non-stick foil. Combine the flour, baking powder and salt and stir well. In a mixing bowl using a spoon, beat together the egg, oil, sugar and extracts. Stir the flour mixture into the egg mixture until incorporated, then stir in the nuts and butterscotch chips. On the foil lined cookie sheet, form dough into a log about 8 ½ inches long by ½ inch thick. Bake for 25 minutes. Let log cool for about 20 to 30 minutes. Set on a cutting board and ,crosswise into 1/2 inch slices. Stand the slices on the baking sheet so that both sides are exposed and bake for 10-12 minutes. Anna, I just bought white whole wheat flour and haven’t used it yet. Could you tell a difference between the all purpose and the white w.w.? Have you used it in other cookie recipes? Have you tried this recipe with white chocolate chips? Anxious for a reply. 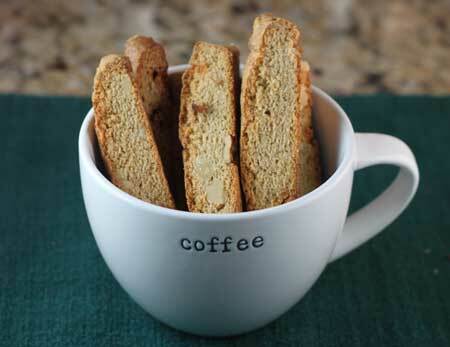 Love the look and sound of these biscotti. Love all you small batch recipes since I’m a family of 3. Hope you are feeling better soon. I am sick right now and would LOVE some of these to go with my cup of Theraflu. But there is no way I have the energy to make these…I hope you feel better soon! I love all of your small batch baking! I love biscotti, but have always been somewhat afraid to make it. But this looks like a recipe I could do! I hope you feel better soon! Biscotti are one of my favorite cookies to make! I hope you feel better soon! You should have some more biscotti. You can eat whatever you want when you’re sick. That’s my rule. Glad you were able to satisfy your craving. I hope they help cure you of whatever is ailing you. Hope you’re feeling better soon. I’m recovering from a cold and I lost some of my sense of taste. Hope it comes back! Sprouts has pizelles and scones – wonder if they sell biscotti? I can’t say I’ve ever craved biscotti when I was sick but I know exactly what you mean when you say you had to have it! It looks like the perfect remedy to me.